I LOVE the Olympics! When else is it completely appropriate to yell “U.S.A! U.S.A!” without fear of angry, judgmental looks or bodily harm?! Our “American arrogance” seems to be forgotten and our actions are deemed patriotic and competitive. I love, love, love it…Thank goodness for the DVR! I have been able to quickly watch my favorite events and acquire some new obsessions. Lindsey Vonn is the epitome of amazing and adorable; I love Julia Mancuso’s personality and of course, her tiara; and Shaun White is, well, Shaun White. He’s far too cool for his own good. 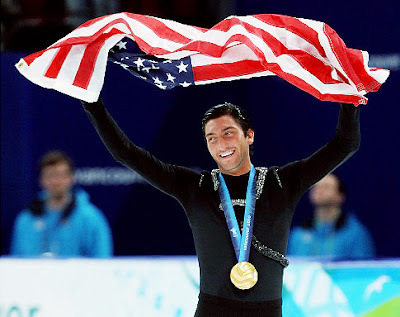 And dear Evan Lysacek…I admit, after I saw him in his costume for the short program, I was disturbed, but my initial judgments were soon completely dissolved. It probably had something to do with the fact that Vera Wang designed it…What an adorable man! And discovering today that he is dating Nastia Liukin?! I’m so in love with that! i am so in agreement with this whole blog. i was even able to look past the snake costume evan had on… but i still think that it freaks me out, yes it does, but i like him. and i like you.